Mixing is a simple enough process. Chefs have mixed everything from soup to sauce for thousands of centuries using nothing more than a wooden spoon. Industrial water and wastewater applications, however, require larger, automated technology. This technology also must adhere to environmental regulations, changing markets, and competitive technologies, which significantly complicate the process of industrial mixing. Submersible mixers have maintained market stability throughout the evolution of industrial mixing technology in a variety of applications. The first submersible mixers debuted in the early 1960s for wastewater treatment. They were also quickly adopted for use in the original step-feed nitrification/denitrification activated sludge process of the late 1970s. Since the 1960s, submersible mixing technology has been used as a highly effective means of mixing for the aerobic, anoxic, and anaerobic reactors required by the biological treatment process. Originally, mixers were designed with small blades operating high speeds. These submersible mixers use a direct-drive motor to produce turbulent flows at a typical submergence of 10 feet. The small blade/high speed technology is ideal for thickening, nitrification and denitrification stages, biological phosphorus elimination, and storm water basin solids suspension. Small blade/high speed mixer have an output range of 20 to 40 hp at speeds up to 1,750 rpm (depending on the manufacturer). They are available with multiple shaft seals to ensure long operating life and to protect against leakage. Certain manufacturers offer extra features on their traditional submersible mixer to provide extra benefits to users. For example, one manufacturer offers three levels of up-front shaft sealing, including a lip seal and two totally independent mechanical seals as standard. Leading manufacturers also use a backward-swept self-cleaning propeller design, hydraulically optimized for reliable mixing with the lowest possible energy costs. These mixers have a robust shaft with sealed-for-life bearings that provide high reliability at low maintenance and service costs. Other manufacturers offer improved reliability and ease of installation by fully sealing the power and control cable cross section, resulting in a simple plug and play connection. Despite add-ons that have made small blade/high speed mixers a popular choice in water and wastewater applications, increasing energy costs have shifted the focus to mixing technology that operates with large blades at slower speeds. Europe was the first country to use highly efficient large blade/slow speed mixers in the 1980s; this technology became the European standard for mixing activated sludge processes by the mid-1990s. The United States has been slower to change due to historically lower energy costs. Over the last decade, however, a surge in energy prices and corresponding rise in environmental regulations has provided motivation for the switch to a high efficiency model. A U.S. EPA report, “Evaluation of Energy Conservation Measures (ECMs) for Wastewater Treatment Facilities” looks to emerging technologies as a solution. Because large-blade submersible mixers have been used in the European market for more than 20 years, they are excluded from this report, but they should not be excluded from consideration for high efficiency water & wastewater applications. 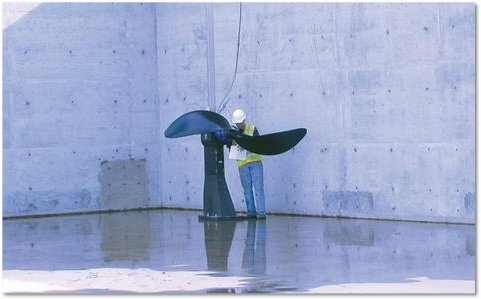 Large blade submersible mixers provide the same mixing results as a small blade mixer while requiring only one-fourth the power. The proof is in the pudding: computational fluid dynamics (CFD) shows almost identical mixing from an 8-foot-diameter (large-blade) propeller turning at 30 rpm and a 2-foot-diameter propeller (small-blade) turning at 600 rpm. The reason for this is because both mixing devices generate approximately the same thrust. The difference is that the large blade mixer will only require 3.5 hp during this process, while a small blade mixer would require 15 hp. Once standardized on a per volume basis (in accordance with the industry standard VDMA 24656), the resulting Mixing Energy Input per Volume Analysis can be used to compare operational costs. This analysis shows favorable comparison of large blade mixer efficiency to other mixing technologies, including hyperboloids, large-bubble systems, and vertical linear motion equipment. Not only are large blade mixers more efficient than other technologies available for water & wastewater applications, but they also offer the same easy maintenance and low cost of small blade mixers. JBS USA is an animal protein processor that operates a packing plant in Grand Island, Nebraska. The company was discharging anaerobically treated wastewater from its packing plant directly into the city's wastewater treatment plant. Because the wastewater was so potent, the food facility was incurring high treatment surcharges from the city, and the city had proposed significant capital upgrades at the municipal plant to address ammonia loading. JBS designed and built its own biological pretreatment system, which included two aeration and two anoxic reactors. The company chose to install 12 large blade submersible mixers in its new facility to achieve the most efficient solution. These large blade mixers required a combined 36 hp to operate, saving more than 200 hp over the same mixing with the small blade alternative. "The low-energy mixing system was exactly what we were seeking, as it provides both effective mixing and high-oxygen-transfer efficiency at minimal energy demand,” says JSB USA environmental director Mark Retsema. Since the facility began operation in 2011, the large blade mixers have performed to expectations. Read the original article on the KSB website.